The Copenhagen decorative mirror offers solid oak construction and looks good accent your existing furniture or paired with any number of pieces from the Copenhagen furniture collection. Use this oak mirror above a sofa, behind an accent table or in a hall to bring the simple refinement of Danish modern design to your space. 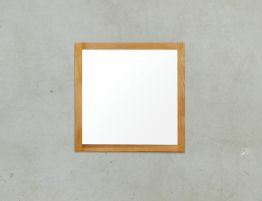 The unassuming sophistication of this oak mirror lends your space a clean, contemporary feel. The Copenhagen Solid Wall Mirror is finely crafted solid oak home accessory to add a unique design detail that elevates your environment. See our complete Copenhagen furniture collection for many more options including a floor mirror that pairs well with this oak hanging mirror.